The old "wheels of steel" seem to be still cruising quite smoothly for British metal veterans Saxon who are on a roll; starting with Killing Ground back at the start of the decade and continuing with Lionheart and their most recent release The Inner Sanctum. 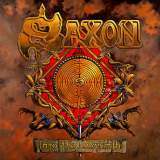 Every Saxon album has some great tracks but they have certainly taken it up a notch or two as far as the consistency and general overall quality with their last few albums. This new album Into The Labyrinth continues the trend with another very solid slab of British heavy metal - all this coming from a band that helped define the genre. Produced by Charlie Bauerfeind (Blind Guardian) and recorded at the Twilight Hall in Krefeld Germany, Into The Labyrinth combines the best of the classic Saxon sound with a little modern influence on a couple of tracks. The album opener Battalions of Steel sees Saxon at its most thematic and melodic best. With some Nightwish style keyboard fills accompanying the guitar riffs, this one has the great majestic and epic style that Saxon can be known for. Not the usual barn-burner of an album opener, this one has a huge chorus and some great shredding lead work. The big "triumphant" style of chorus on this track can also be heard with Valley Of The Kings, another in the long line of "historic" like songs in the Saxon repertoire. Somewhat speedy riffs for the verses lead into a huge, orchestrated and very moving chorus; and one of their best in many years. The very driving and up tempo Saxon is still here in all its glory with tracks like Demon Sweeny Todd and Hellcat. Demon Sweeny Todd explores the historic events surrounding the "Demon Barber Of Fleet Street" and with speedy pull-off riffs and fast driving metal, this one takes the listener back to the classic era of the band's Strong Arm Of The Law and Wheels Of Steel albums. Saxon is also known for their fist-pumping metal anthems and the first single from the album Live To Rock is just that. A standard 4/4 time rocker, this one again takes ther listener back to the early 80's Saxon. Slow Lane Blues continues in a similar vein and even though a little more laid back and bluesy feeling, its still very catchy with a great chorus. More mid tempo, thick riff driven Saxon is heard with Come Rock Of Ages and a short instrumental Premonition In D Minor sets up the track Voice. A powerful and emotional ballad like song, this one has some similarities to the great Broken Heroes from their Innocence Is No Excuse album. Crime Of Passion and Protect Yourself use drop D tuning for a more modern effect with Protect Yourself taking on more Black Sabbath like overtones with its riffs and plodding heaviness. The album finishes with an acoustic slide version of Coming Home from their Killing Ground album. This works surprisingly well in this case yet from what I hear, the dreaded "acoustic album" appears to be in the works down the road for Saxon. Overall this album is definitely "front heavy" with the first 5 or 6 tracks being of very high quality and a couple destined to become future Saxon classics. The second half of the album still has some strong songs yet the overall quality dips a bit. There's also a very different feel for the second half and one that takes a few listens to really get into. Otherwise, the first 5 songs are worth the price of this album by themselves. Biff Byford's voice keeps getting better and stronger than ever and the guitar duo of Paul Quinn and Doug Scarrett offer up some amazing lead guitar work. Very tasteful melodies, just the right amount of shredding and some great trade-offs gives Into The Labyrinth the right to boast of having some of the best lead guitar work on any Saxon album. The band has apparently recorded an extra track that is to be eventually released through iTunes and a special limited edition of this album will also be available with a bonus DVD containing behind the scenes of the making of the album. Even with a couple of slightly substandard tracks, Into The Labyrinth continues with and in a few instances, even surpasses the quality of the last three albums. A couple more huge metal anthems to go along with the absolutely superb ones found here and this album would've been a masterpiece. Into The Labyrinth doesn't sound dated or stale by any means and shows that there's still lots of fuel in tank for Biff Byford and the boys......a must for Saxon fans! !